GPx GRAPHENE NANOPLATELETS is a product obtained from our own “top-down” manufacturing process by exfoliating graphite. Graphene is produced with different number of layers (ranging 5-40 layers) and average specific areas (100, 300, 500 m2/g). Graphene platelets represent a new carbon material with multifunctional properties. Size and morphology make it particularly effective at providing barrier properties, while its pure graphite composition makes it an excellent electrical and thermal conductor. Graphene as filler or additive is preferred over other conventional fillers due to their high surface area, aspect ratio, tensile strength, thermal and electrical conductivity, electromagnetic shielding, flexibility, anti-friction, hydrophobicity, transparency, and low coefficient of thermal expansion. GPx Multilayered Graphene is compatible with almost all polymers, suitable as active ingredient for inks or coatings, as well as an excellent additive for all kind of plastics. These multilayered graphene powder can be easily dispersed in many solvents. The prices are significantly lowered for bigger quantities. 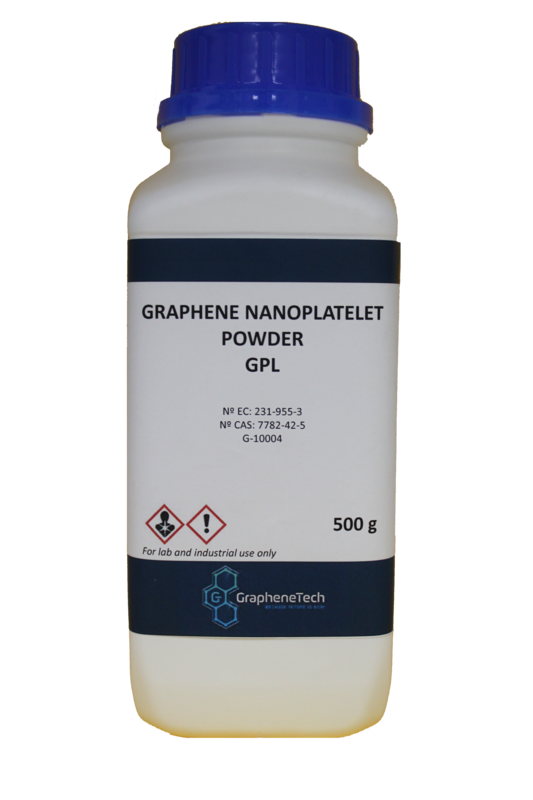 Consult us trough the e-mail info@graphene-tech.net or filling our contact form. You will receive a customized treatment. Please contact us to discuss your specific needs or for advice on choosing specific material for your application. Our work philosophy is to establish a direct relationship with our customers and collaborators in order to achieve the expected results and their total satisfaction with our work.